My son Adam (10Years old) needs a new quilt. I have been asking him what he wanted. He has had real ideas of what he likes and dis not likes. He loves the quilt I made for his dad last year for Christmas Here. He likes the plaid fabrics. So for a couple weeks we have been talking about it. On Sunday we pick a quilt pattern out and got started. 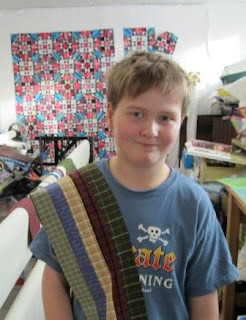 Adam helped pick out which plaids he liked and wanted to use in the quilt. Orca Bay is still untouched in three weeks now. Hope to work on it this week. You can see it behind Adam below. He got so involved with it all. I showed him how to cut with the rotary cutter and he got a few strips cut. Then I showed him how to sew. He has never done this stuff before. He has not shown much interest. I am happy to work on this quilt with him. He got one strip set made. Now you are asking what quilt pattern did we pick? We are going to do a 60 degree Spider web quilt. It will have 6 units in each spider web and it will be equilateral triangles. There will be a Red equilateral triangle between the spider webs. It is a Fon's and Potter pattern from back in 2000. 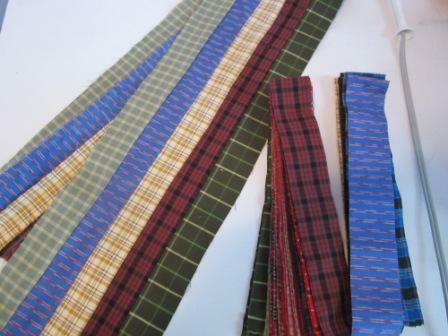 I cut more strips. Adam plans to come and sew a strip set or two over the next few week ends. 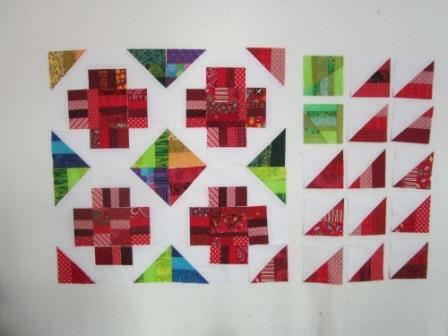 I am sure I will do most of the cutting and sewing blocks together. He does not want to do it all. He also wants me to do all the machine quilting on the long arm as he know I am good. I spent sometime playing with my Red scraps form the Rainbow Challenge. I posted on Saturday that I was not sure which block but now I am liking this Greek Cross with the coloured diamonds in between is the best. I will start working on the next colour. Yes I know what colour is February. I have made this part of Patchwork Times Design Wall Monday for Jan 30/12. Go check out all the design wall ideas. I try to get though them all but it is a lot to get though. I love that your son is interested in helping to make his quilt! I also really like your choice for your Greek Cross blocks - the coloured diamonds make it sparkle. Good for your son! What a great memory to build together. Love your rainbow challenge blocks. Oh look at that, you have someone to help with their own quilt,that's awesome! Your red rainbow challenge blocks are beautiful! Good for Him! He has a good eye, knows what he likes. Very nice January Rainbow Challenge blocks. Love your blog! I'm looking forward to reading your older posts. Absolutely love that you've got your son sewing! 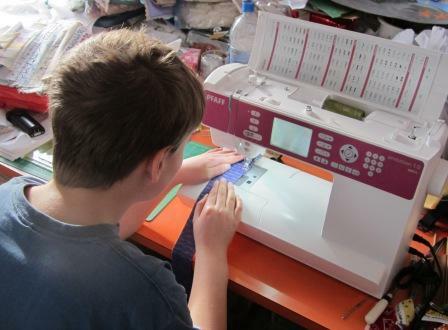 I've done a lot of sewing with school children and its pure joy watching them master the machine and discover the fun of making something themselves! nice job Adam... can't wait to see your design wall! !